Spirit Lake City Hall is located at 1803 Hill Avenue, Spirit Lake, IA 51360; phone: 712-336-1871. 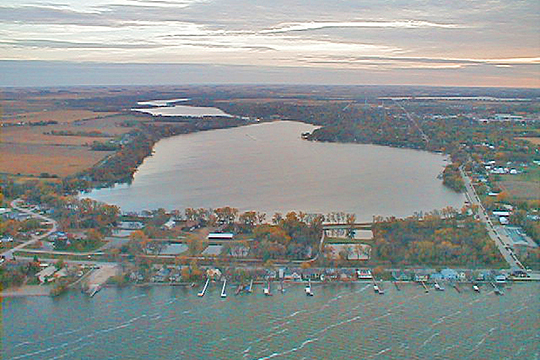 Photo: City of Spirit Lake looking south from over Spirit Lake towards the city on the west shore of East Okoboji Lake. Photographed by User:Skywayman (own work), 2006, [cc0-by-1.0 (creativecommons.org/publicdomain/zero/1.0/deed.en], via Wikimedia Commons, accessed October, 2015. The first settlers came to the Spirit Lake area in 1856. An election to organize the county was held in August 1857. Dickinson County was named in honor of Daniel S. Dickinson, a United States Senator from New York. According to sources from A History of Dickinson County, the entire lakes region was known wholly as "Spirit Lake" in the early days. The region's population grew in the following years but remained low, until after the Indian Wars of 1862-1863. During the grasshopper plague of 1873-1877, more than half of the region's settlers left the area. Based primarily on the habits and needs of the nomadic Sioux Indians, the Iowa Great Lakes region was used primarily as a hunting ground and temporary encampment. The City of Spirit Lake is the largest city in Dickinson County and the capstone of the Iowa Great Lakes. It is located to the south of Big Spirit Lake, the largest natural lake in Iowa, and on part of the western shoreline of East Okoboji Lake. The glacier-dug chain of lakes is well known for its beauty and recreational opportunities. In the fall of 1856 three brothers-in-law, O.C. Howe, B.F. Parameter and R.U. Wheelock, visited the lakes region. They were so impressed with the area that they determined to return, acquire land and lay out a town. According to R.A. Smith in A History of Dickinson County Iowa, an important task among the early settlers was the naming of the different lakes, or rather familiarizing themselves with the names the French settlers and native Indians already gave the lakes. Spirit Lake was well known in the area as "Minne Waukon" by the Indians. This name was having been said to mean "the Spirit Water." The early French settlers called the lake "Lac d'Esprit" which literally translated into "Lake of the Spirit." The Dacotah Indians called East Okoboji Lake "Okoboozhy" and West Okoboji was assigned the name "Minnetonka," signifying big water. Since there was already a large popular lake in central Minnesota also called Lake Minnetonka, the Iowa Minnetonka name was dropped and renamed West Okoboji. Other families had built cabins along the shores of the several lakes that summer, but this settlement met with tragedy on March 13, 1857 during a clash between the early settlers and a renegade band of Sioux led by Chief Inkpaduta. On that fateful day all of these early pioneers were killed except for four women who were taken captive. When the news reached Ft Dodge, Howe Parameter and Wheelock were among the 100-man relief expedition which returned to the lakes. In June of 1857 the three men along with George E. Spencer became the original proprietors of "Spirit Lake City," as it was then called. Just to the north in the Minnesota Territory tensions still continued between the Dakota Sioux and the early pioneers. Local citizen concern led to the building of a fort in the Iowa lakes area in the summer of 1857 on the ground where St. Mary's Catholic Church now stands. A historical marker placed at the corner of Hill renowned trap shooter, was enshrined in the Amateur Trapshooting Association Hall of Fame in 1969. A park toward the north end of the city bears his name. Another Spirit Lake native loved to fish as much as the rest of his family and made a name for himself not by competing in the sport, but by founding the Berkley Fly Company. In 1937 Berkley Bedell began his business in his home while still in high school. The expanded Berkley and Company became a national leader in the fishing tackle business. Now named Pure Fishing, the industry headquarters is located on Highways 71 and 9. Bedell also served as a U.S. Congressman from the Sixth District from 1975 through 1986. The early pioneers lived through crop devestations by blackbirds and grasshoppers; times of plenty and times of drought. The water levels, often a point of discussion, rose to record highs after heavy and persistent rains in the spring and summer of 1993. Residents of Spirit Lake and surrounding communities constructed various sandbag barriers along lakefront properties and roadways. The water receded only after emergency enlargements of the Lower Gar and Orleans outlets. Through the years, business and professional men and women of the city have been supported by first the Spirit Lake Commercial Club, then the Spirit Lake Chamber of Commerce and now Spirit Lake Mainsail, a division of the Iowa Great Lakes Area Chamber of Commerce. Mainsail celebrated its 16th anniversary with the traditional June Mainsail-A-Bration. The downtown, surrounding residential areas and parks hold a bit of history at every turn. The Hill Avenue Beautification Project (1995-2004) sought to remind us of an earlier era. The street lights, pavers, benches and plantings do just that. The original Carnegie Library east across from the court house no longer houses books, but has been put to very good use through the years. It was dedicated in 1912 and is on the National Register of Historic Places. As you walk north through the downtown, notice the dates and inscriptions on some of the other buildings. Just to the east of the downtown area on Lake Street discover a residence that was the mansion of a former State Senator. The citizens of Spirit Lake, now a city of nearly 5,000, have been careful to remember and preserve some of the past while moving forward to expand their city in the important role of a business, cultural and recreational center. Both the Dickinson County Museum at 1708 Keokuk and the Spirit Lake Public Library at 702 16th Street hold many more stories from the past—a past of which Spirit Lake is very proud. City of Spirit Lake with Northwest Iowa Planning & Development Commission, 2009 Comprehensive Plan, www.cityofspiritlake.org, accessed October, 2015.